As a distribution company, it's important for you to source products and work with new suppliers quickly by seamlessly integrating them into your supply chain. After all, ready access to information about suppliers, inventory levels, outstanding orders, and shipments translates to cost control and rapid order turnaround. 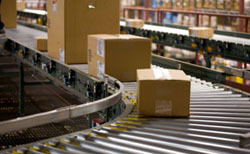 Ideal for wholesale distribution companies, Sage X3 includes features like warehouse management, flexible inventory sourcing and allocation, sophisticated pricing and promotion management, and after-sales service, all critical areas in helping wholesalers and distributors to control costs and better service customers. Shipping is simplified in Sage X3. With features like rate-shopping, Web-based shipment tracking, and automated customer e-mail shipment notifications, distributors can better service customers and save money in shipping costs. You can also make effective use of the sophisticated inventory allocation routines against incoming shipments in Sage X3, which even automates landed cost calculations. Sage X3 makes it easy to share common data and processes between different foreign sites or subsidiaries, while respecting the specific usages and business rules of each. Multinational requirements are especially important in mixed manufacturing and distribution environments, particularly for managing multiple currencies, languages, legislations and sites. Fine-tuned to meet your specific industry requirements, Sage X3 provides the advanced functionality you need to be successful in today's global economy.